Are you ready to launch an exciting, rewarding Professional Organizing Business? Come join the Clear & SIMPLE Circle of Organizers and make your dream a reality! Skip the years it takes to come up with a successful, highly-functioning systems by taking Clear & SIMPLE’s Self Study Course. 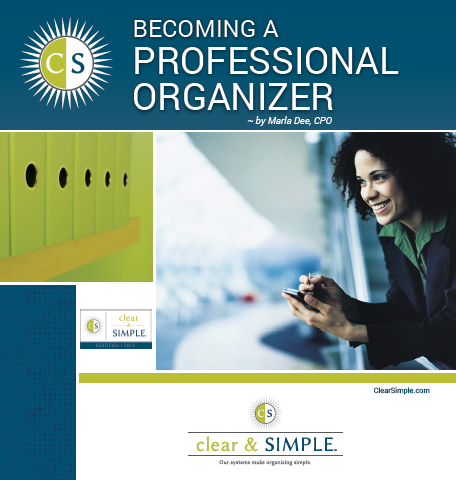 For over a decade, we have been training professional organizers around the world. We are very proud of our successful organizers in 9+ countries. This comprehensive course is self study allowing you to do it on your own timing, while also giving you expert guidance and one-on-one coaching through all the levels of learning. It is the prerequisite for Level II Certification & Level III Mastery. You will receive all the information you need to set up, launch and work with clients with confidence. Follow your bliss! Become an organizer. Upon completion of the Level I Course, you can take the exam and receive a Certificate of Completion, along with the credential of Clear & SIMPLE Organizer | CSO®. This tells the outside world and your clients that you have done training in a methodology and can offer professional systems. ** Please note that before we ship your course you will need to sign Our Copyright Agreement. Shipping and handling is an additional cost, billed separately through PayPal. Within the U.S. $35. We DO ship internationally, please contact us for more information.